Why Would You Want To Use Old Farm Equipment? Posted 11:37 am by Chris & filed under Farm Equipment. You can use old farm equipment an alternative to buying brand-new equipment that can cost you thousands to hundreds of thousands of dollars depending upon the size and scope of the equipment when it does, cost and efficiency is a very important consideration. I remember the first tractor that we bought. We had been looking for tractors for about six months. My father came home with a 1940 ford 9N. The tractor was in about 120 different pieces, but we were able to trade some work and $50 for the purchase of the tractor. We could get it to start, they look like it’d been sitting outside for about 100 years, even though I knew it was only about 30 years old. When we got done with our chores, on Saturdays, we would spend about 4 to 6 hours working on the tractor. It became a fun project for my father and I. By the time we had it all back together, it looked like brand-new, however we painted it a little bit different so everyone would know that it was our tractor. So why would you want to purchase old farm equipment? The following list will give you the advantages of using old farm equipment. Easier to work on and maintain. The enjoyment of having equipment with character. Usually a smaller and or compact size. Better fuel economy for most older pieces of equipment. You can find used parts for a lower cost. The equipment can also be used in your advertising. Better for the environment when well maintained. it is usually paid off at purchase, or shortly thereafter. You get to bring joy to many people while you are searching for parts! Old farm equipment is a great way to recycle. 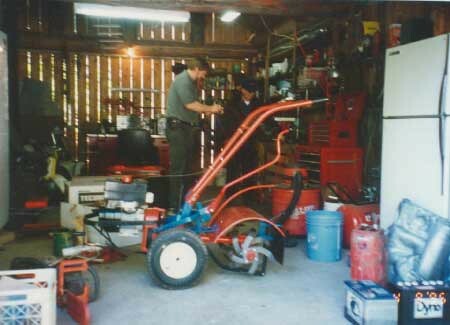 You may experience a learning curve on the maintenance and repair of the equipment that you purchase. Parts stores or dealers may laugh when you tell them the equipment that you have and the part that you are looking for! Been there, done that! Now that I’ve told you the advantages and disadvantages of old farm equipment, I want to tell you what to look for your purchasing old farm equipment and what to stay away from. Research the equipment before your purchase it. Is that brand of equipment still being manufactured today? If so, does the manufacturer still service the equipment? What is the reliability of the equipment that you are going to purchase? Do your homework and talk to as many people that you can about that type of equipment. Do not buy the first old farm equipment that you see. Do not believe everything that you hear from the seller, unless you know them. Do not purchase your equipment as an antique and expect to make a profit from that aspect of old farm equipment. Do not purchase your equipment just because it looks cool. Do not purchase your equipment if you do not understand or think that you can learn how to repair and maintain it. As you assess your needs for equipment to help you increase your production on your farm, remember that this is an Investment in yourself. You will be healthier and happier if you keep your business and life in balance. God created you to follow your purpose and passion. Keeping up with the Jonses or Clampits (Beverly Hillbillies) is not a means to an end. Old Farm equipment can help you increase your profits and lower your expenses as you choose wisely! Send us your pictures and tell us your story of old farm equipment. Keep your life in balance, and you will enjoy the Journey as you travel through life!